This Rupert Neve-designed three-band EQ and preamp is intended for Taylor acoustic guitars equipped with the Expression System magnetic pickup array. 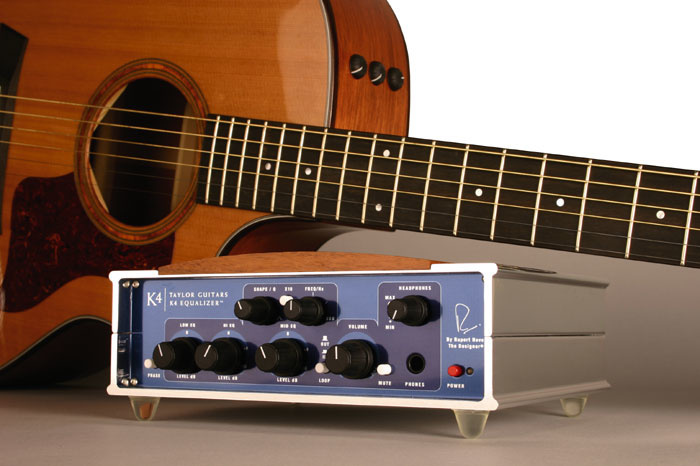 Taylor's K4 Equaliser is designed primarily to operate as a companion to the Expression System (ES) acoustic guitar pickup that is built into many of their instruments. The K4 provides a single channel, three-band EQ in a distinctive stand-alone, chrome-and-hardwood housing and, like the Expression System's on-board preamp/EQ, it was designed in collaboration with legendary console designer Rupert Neve. A transformer-coupled XLR/TRS combi-jack accepts nominally mic- or line-level signals, but there's no gain control as such — the system's preset gain is set to suit the balanced, buffered, low-impedance output of a Taylor ES guitar. Actually, there's another 10dB of gain available if you turn up the output volume beyond its centre detent, making about 16dB available when using the TRS line input and about 50dB via the XLR, so you could use it as a mic amp on louder sources, although there's no provision for phantom power. The output is via XLR at mic level and TRS jack at line level. Both outputs are balanced and may be used simultaneously, allowing the K4 to be used as an on-stage split, feeding both PA and an amp, for example, or PA and a direct recording feed. A dedicated Tuner output allows you to keep your tuner out of the signal path and picks up its signal right at the front end, remaining active whatever else you do to the controls. Separate Send and Return TRS jack sockets for the switchable effects loop allow interfacing to remain fully balanced, avoiding the forced unbalancing of the more common TRS, send-and-return insert point. By switching the EQ to post-loop and plugging into the insert return, you can bypass the gain stage and use the K4 just as an equaliser with line-level sources. A phase-invert switch is there to assist in reducing feedback, or to match the DI signal's polarity to that of an additional mic on the guitar, and there's a ground-lift switch to eliminate ground loops, where necessary. A front-panel headphone jack with its own level control completes the connections. Power (3-15V DC) is via an external DC transformer or, in an emergency, two 1.5V 'C' cells that will run the unit for up to 10 hours. The K4 has +/-10dB low- and high-frequency shelving filters, with 125Hz and 8kHz corner frequencies respectively, and a single, fully-parametric +/-10dB mid-frequency band, sweepable from 80 to 800Hz, with a x10 range multiplier. All of the gain controls in the EQ section are centre-detented with adequate legending, but only the extremes of the mid-band frequency control (80Hz and 800Hz) are marked. I, for one, would have found a few more markings helpful. The K4's configuration of two fixed bands with a wide-ranging parametric mid-band is a common enough design choice and perfectly effective in most applications, but given that the Expression System itself already has built-in high- and low-frequency shelving EQ, there is surely a strong argument to be made for equipping its companion equaliser with two fully parametric bands instead. As it stands, the K4's EQ configuration is fine for recording applications, where the majority of your tonal shaping is likely to be of the creative kind, sculpting the response into the precise tonality you want. But in live performance, the EQ challenge is entirely different. Taylor's Expression System is one of the most inherently feedback-immune pickup systems out there, but at performance levels it can still feed back, even if only via the strings 'taking off' on certain notes. Notching out the guitar's primary resonant frequency will yield a few more dBs of additional level or a useful safety margin, but with only one sweepable band you are sometimes faced with a choice between creative or corrective applications when you really want both. That aside, the K4 is a beautiful-sounding equaliser, with a warm, organic character that means the signal never sounds harsh or over-EQ'd, even at quite radical settings. With an ES-equipped Taylor 514 as the source, most of the time I found I only wanted to add or subtract a tiny amount of the body of the tone with the low-frequency band (depending on whether I was picking or strumming), add some gloss to the top end with a couple of dBs of high-frequency boost, and dip out a tiny bit of mid-range. The Expression System's magnetic string-sensor and body-sensor combination produces a fairly warm-sounding output anyway and the K4 seems to perfectly complement that. Using a guitar with a Sunrise magnetic pickup (via its essential SB1 buffer interface) produced similarly pleasing results at a range of settings. There's a lot of overlap between bands — both high- and low-frequency bands extend well into the mid-range and the mid-frequency band spans more than the entire range of both. This generally makes it very quick and easy to get what you want, although guitars with under-saddle pickups — I also tested the K4 with an L R Baggs Element and a Fishman Matrix — fared less well, to my ears, than the Expression System guitar. The K4's fixed high-frequency shelving filter starts to rise at about 1kHz, reaching full boost at 8kHz. Consequently, when enough boost is applied to add some extra high-frequency sheen, the filter is also creating a bit of lift in the upper mid-frequency 'quack' zone. Of course, you can counteract this using the parametric mid-range band, but not if you want to be using it to drop out some of the mid-range! However, equalising an under-saddle pickup is inherently compromised anyway, as you are essentially always chasing a moving target — the spectral content of the output varies with level sufficiently for your EQ setting for loud strumming to be completely wrong for fingerpicking, and vice versa. The 'four bands plus feedback notch' configuration of something like the ubiquitous L R Baggs Para DI — though that unit is undeniably not as sweet sounding as the K4 — seems perhaps to be a better tool for this job. Although you can get fine results out of the K4 in other applications too, such as bass and electric guitars, I think it, unsurprisingly, does its best work with the source for which it was designed — an ES-equipped Taylor. However, the asking price would buy you a very nice, fully-featured channel strip with an on-board power supply, a variable gain control and dynamics processing, which would undoubtedly be far more useful in a variety of other applications. And, in the absence of a high-impedance input (1MΩ or so) suitable for passive electric guitars, and neither variable gain nor a variable high-pass filter, it is difficult to raise an argument for the K4 as the guitar-optimised recording system front-end that it might have been. If you are a Taylor ES user, the attraction of the K4 lies in knowing that you will be getting the absolute best out of the whole system. It offers optimal impedance and level matching, high headroom and very low noise, in a format that lives up to the quality image of the brand, whilst also being robust enough to sit on the floor amongst the other DI boxes at a gig. The EQ delivers warmth and detail with pristine sound quality, albeit at a premium price. But if you are opting for a high-end, ES-equipped Taylor guitar anyway, why not go the whole way? Optimised for Expression System guitars. No high-impedance input for passive instruments. A premium-quality preamp/EQ for Taylor's Expression System guitars, at a premium price. The absence of a few key facilities may limit its appeal in broader applications.